OK guys, time for the next question. Is the Hasegawa P-40 series all based off the same basic set of moulds? It's my understanding that this kit is engineered to allow multiple versions to be made via the use of the appropriate inserts and whatnot. Is this true for all of them? I don't know that much about P-40s or the Hasegawa kits. They all seem to have the same fuse and wings. Parts for individual varients are on separate sprues. Great source of box contents is on 1999.co.jp. 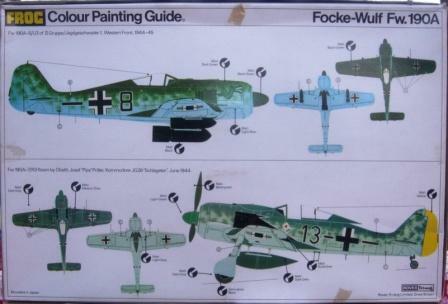 There is lot of kits with full instruction sheet and decals there. Thanks Pavel. They certainly all look like the same tooling to me! This is for a Frog Spitfire XIV kit, which includes a V-1 and is noted to be based on Hasegawa's plastic. I'm 99.9% sure that this is actually Frog's ancient 1/72 kit, and is in the database in error. Can anyone confirm? 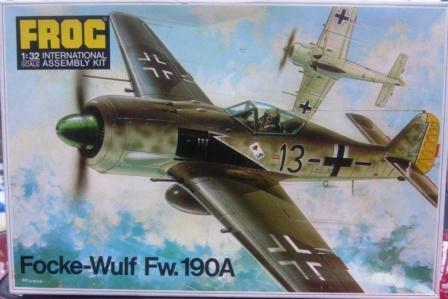 Google searches have been inconclusive, other than turning up a few hits on the 1/72 kit (which includes the V-1), but nothing about a 1/32 version. And you certainly can't get there from any of the Hasegawa kits! I remember that release and it was definately 1/72. Hi, I finally got to the basement and photographed the Frog 1/32 Fw190A, which I am pretty sure is a pop from the Hasagawa molds. I have the colored plastic kit parts in the original sealed plastic bag. I have the box and the instructions. I am missing the canopy and the decals. Here are the photos of the box front and the bottom of the box. Here is what the bottom of the box looks like. It is Frog kit number F278. Now all I have to do is get a canopy for it and a sheet of decals. Thanks Stephen. I've already got box art for this kit in the database, but I've added your image of the back for completeness. It's a little low-res unfortunately, but gives the general idea. OK, on to the next question. The database lists two Sea Fury kits by Special Hobby (#1 & #2), but I believe these to be erroneous. They're either misidentified Hobbycraft kits (though these are already in the database), or misidentified Special Hobby 1/72 kits. So, firstly, am I right and these are wrong? Secondly, am I safe to delete them or should they be part of the existing Hobbycraft group (#1, #2, #3)? Kev, I can take a better picture with my son's camera and send you the heavy image via email. How to do that and what is the address to use? I can also scan the instructions if you want. No need Stephen; I think we'll get by with what you've already sent. If you've got any more gems, go for the hi-res shots and send them too kevin@largescaleplanes.com. Anyone got any ideas about this one? I can't say with certainty, but the kit numbers are the same (minus the HC) and I've only ever seen the HobbyCraft releases. I think Special Hobby ones are a mistake that should be removed.